We're a BIKE SHOP, not a website! Come see us. Hold, touch and feel. 1. 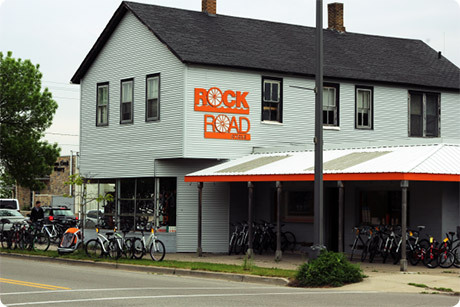 West Michigan's bike shop since 1985. 2. We are BIKE MECHANICS first, salespeople second. We all do repairs, even the owner man does his share. 3. Bikes that fit are bikes that are ridden. Think of jeans. We have the FIT KIT™. 4. Bikes are assembled to last and work. We do a year of FREE service on new bikes, but we assemble our bikes so we hope you won't have to use it! 5. Products we use and love. We know our merchandise because we use it. In fact, it’s in our store because we love it. We don't have stuff here just because a bike brand makes us buy it in order to sell their bikes. We take in trades, fix everything and sell them. No one else does. When our suppliers back up their product, we can treat our customers the way we want! That's why they are our suppliers. Somehow you can't claim to have honesty, integrity and humility all at the same time, on the internet. So please come experience truthfullness at our store. You'll find it in our fair pricing, warranty performance, service work and conversation. If you experience anything other than honesty and integrity at Rock 'n' Road Cycle, please take it up with me, Tim Meyer, owner since 1985. Of course when one of us does something absolutely outstanding, I always like to hear that too!